During the 16th century the principal artistic centres in Spain were Castile, Aragon, Andalusia and Valencia. In Castile the leading artists were Alonso Berruguete (1486-1561), who trained in Italy and was a profound devotee of Michelangelo, and Pedro Machuca (c. 1495-1550), a committed follower of Mannerist models derived from Raphael. Notable in Aragon was Damián Froment (c. 1480-1540), while in Andalusia Pedro de Campaña (1503-1580) and Luis de Vargas (1506-1568) were leading figures, the latter also having trained in Italy, with Perino del Vaga. Finally, in Valencia the preeminent figure was Juan de Juanes (c. 1510-1579) and his circle of Roman-influenced painters. The present drawing should be located within the context of Valencia in the second half of the 16th century. It is a small-scale image, executed in rapid strokes of black chalk, of the Eucharistic Christ, represented half-length. He holds up the Host in his right hand, pointing to it with the other hand. Lightly sketched on the table is a chalice. The image is an exact reproduction of models by Juan de Juanes, the preeminent figure in Valencian painting from 1550 onwards. Among his most celebrated images are those of the Eucharistic Christ, derived from the painting by his father for Valencia cathedral around 1525, which would become widely disseminated through popular devotion. The earliest known version of this subject by Juan de Juanes and hence his first depiction of this subject (c. 1545-1550), was painted for the high altar of the church in Fuente la Higuera (Valencia) and is now in the Museo del Prado (inv. no. P-844). 2 The artist used this composition as the basis for one of his most celebrated works, The Last Supper (Museo del Prado, inv. no. P-846), painted around 1562 for the lower level of the altarpiece in the church of San Esteban (Valencia), and for the Eucharistic Christ in Valencia’s cathedral. A careful examination of the present drawing will reveal that the figure is extremely close to both those works. 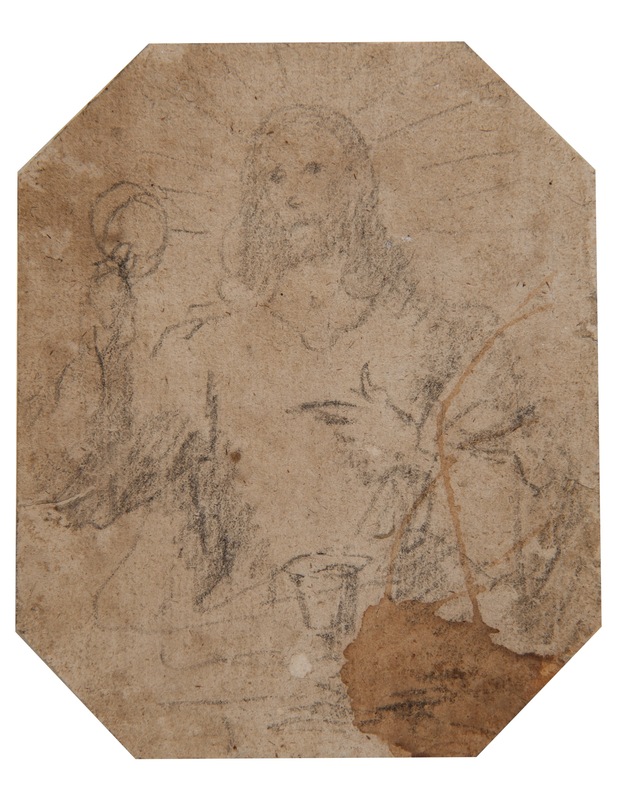 This may explain why an earlier owner considered that it was a small sketch for the Prado painting, attributing it to Juan de Juanes, as noted on the reverse of the sheet. However, the technique of this drawing bears no resemblance to surviving drawings by that artist, all of which are in pen with sepia washes and, on occasions, make use of lead white highlights. 3 It should thus be borne in mind that Juan de Juanes’ prototype was very extensively repeated, firstly by his pupils (including his son Vicente Joanes, in addition to Nicolás Borrás and Nicolau Factor) and later by some of the leading Valencian painters of the 17th century. Among the latter are Francisco Ribalta, who in his Last Supper for the Colegio del Corpus Christi (1606) and in his drawing of the Eucharistic Christ formerly in the Instituto Jovellanos (destroyed in 1936), 4 made use of Juan de Juanes’ model. We should thus consider the present study to be the work of an anonymous Valencian follower of Juan de Juanes, executed around 1550-1600. From an iconographical viewpoint this sketch conforms perfectly to the precepts on sacred images promulgated by the Council of Trent. Trentine instructions stipulated that religious images pertained not only “to the sphere of sacred symbols but also to that of art, and while images introduce us into the mystery and transmit a spiritual message, they also reflect the nature that comes from God and leads to God, for which reason the aesthetic element within them should not be neglected and should certainly not give rise to errors among the faithful through the said sacred depictions.” 5 In general, these precepts conveyed the concept that the religious image should combine the decorum and solemnity necessary for moving the faithful to devotion and piety, becoming as a consequence true icons of a completely idealised type. Pérez Sánchez, Alfonso E., Historia del dibujo en España. De la Edad Media a Goya. Madrid, Cuadernos de Arte Cátedra, 1986, pp. 118-129. See: Joan de Joanes. Una nueva visión del artista y su obra. Exhibition catalogue, Valencia, Museo de Bellas Artes, 2000, pp. 76-77. For Juanes’ technique, see: Pérez Sánchez, Alfonso E., Historia del dibujo en España. De la Edad Media a Goya. Madrid, Cuadernos de Arte Cátedra, 1986, pp. 129-130. The Museo de Bellas Artes de Valencia has a preparatory drawing for The Last Supper in the Prado. Reproduced in: Joan de Joanes. Una nueva visión del artista y su obra. Exhibition catalogue, Valencia, Museo de Bellas Artes, 2000, p. 161. Reproduced and commented on in: Pérez Sánchez, Alfonso E., Catálogo de la Colección de Dibujos del Instituto Jovellanos de Gijón. Gijón, 1969, p. 111, no. 426. This model is also repeated, albeit with some variants, in the drawing of The Institution of the Eucharist by Ribalta in the Museo de Bellas Artes de Valencia. See: Espinós Díaz, Adela, Museo de Bellas Artes de Valencia. Catálogo de dibujos I (siglos XVI-XVII). Madrid, 1979, p. 95, no. 117. Martínez Leiva, Gloria and Rodríguez Rebollo, Ángel, “Semblantes en el Arte. De lo humano y lo divino” in Semblantes. Colección Granados. Exhibition catalogue, Segovia, Caja Segovia, 2011, pp. 23-24.